Simpson Millar’s specialist travel lawyers claim compensation from tour operators including Virgin, Red Sea Holidays, Thomas Cook, and First Choice etc. Experience counts when it comes to pursuing compensation claims against tour holiday companies and our travel team has well over 70 years of experience dealing with gastric illness claims in the travel industry both as defendant and claimant lawyers. Were you ill in Egypt with food poisoning? Suffered salmonella food poisoning on a Thomas Cook holiday? The Package Travel Regulations are there to protect you? Illness from food poisoning is preventable with good hygiene. Amongst the oldest Red Sea cities the name El Quseir translates as 'small fortress or palace'. This once bustling Roman port is the setting for the Ottoman Fort. Tourists flock to El Quseir to partake in trips into the desert and camel riding expeditions and the local Bedouin village bazaars. Miss a trip due to illness? El Qusier – Food Poisoning and Sickness in Egypt? Fact: E. coli is a friendly bacterium that lives in the stomach and helps the digestive system to break down the plant structures we eat. However, the E. coli (0157) strain is very different and potentially deadly. Be careful when on holiday to avoid eating burgers that are pink in the middle which are made of minced meat that attracts the bacteria forming E Coli (0157). We don't just monitor the larger tourist resorts in Egypt for complaints of illness affecting holidaymakers. Illness in Egypt – Claim Compensation! Tour operators such as Thomas Cook – Red Sea Holidays- Thomson Holidays and Jet2Holidays who are approached by their customers directly often attempt to settle holiday illness complaints at a fraction of their true value. Travellers who suffer illness due to food or waterborne poisoning caused by Salmonella, Giardia, Campylobacter, Cryptosporidium etc. are often entitled to claim much more compensation than a £300 voucher – a gastric sickness lasting 12 days is worth over a £1100.00 for pain and suffering. In addition, you are entitled to claim for loss of holiday enjoyment if your stay in Egypt was spoilt by illness through the failings of your tour operator or its hotel suppliers. Simpson Millar’s specialist holiday illness team can represent you on a 'No Win No Fee' Basis and guide you through the holiday claims process. Fact: The Food Standards Agency in 2009 reported that 65% of chickens sold in supermarkets in the UK carried the Campylobacter bacterium that is the main cause of food poisoning. If you have suffered food poisoning from Salmonella, Shigella, E. coli or Shigella etc. whilst on holiday in Egypt contact Simpson Millar’s Holiday Compensation Claims experts immediately for advice. We pursue hundreds of holiday sickness claims every year against the UK’s biggest holiday companies pursuant to the Package Travel, Package Holidays and Package Tours Regulations 1992. 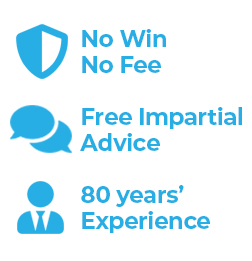 We are happy to discuss representing you on a 'No Win No Fee' basis. Contact our experienced holiday claims team on 0808 145 1353 or complete the online claim form and we will assess your holiday complaint against Thomson, Thomas Cook, Red Sea Holidays etc.